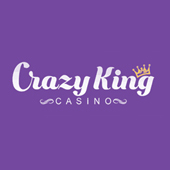 Crazy King casino is a brand new, UK-friendly online casino and one of 100+ gaming sites managed by Jumpman Gaming Limited, an operator that also boast a portfolio of its own brands such as Aladdin Slots, Dove Slots and Dove Bingo. The team has chosen not to invest tons of effort into making the website visually unique but made sure it’s dead easy to use. Thanks to a simple layout and few but useful filtering options, it takes next to no time to find games of your choice, explore available promotions, make a deposit or ask for assistance. Crazy King casino has sourced slots from Microgaming, NetEnt and close to 20 other developers. New members can collect up to 500 free spins and enjoy a month of double cashbacks. The Casino’s packed promotional page displays a range of ongoing deals to pick from. By completing fun tasks, players can unlock trophies and reach new levels for a chance to spin the Mega Reel. There’s also a loyalty scheme based on points awarded for deposits, and daily cashbacks and free spins delivered via VIP club with 5 tiers. While you’re enjoying all of the above and more, two trustworthy regulators make sure the venue is safe, gameplay fair and players well looked after. An internet connection is all one needs to access Crazy King casino and play more than 600 casino games. Google Chrome is the recommended browser but others will also do. The list of contributing developers is quite impressive; on top of games supplied by the aforementioned leaders, players will also find those produced by NextGen, Yggdrasil, Big Time Gaming, ELK Studios, Leander, Pragmatic Play, Eyecon, Barcrest, Playson, 1×2 Gaming, Saucify, Core Gaming, Tom Horn, Inspired Gaming, Sunfox Games, High 5 Games and Red Tiger. Crazy King casino is clearly crazy about slots and doesn’t feature much else. It does, however, provide mega popular titles like Blood Suckers, Guns ‘n Roses, Immortal Romance, Foxin’ Wins Again, Bonanza, Rainbow Riches, Double Dragons and Fluffy Favorites. Bar Bar Black Sheep and Sevens & Fruits are only a couple of the alternative options added for the benefit of those who prefer classic slots. Thanks to Microgaming, one can also enjoy releases from upcoming brands such as Crazy Tooth Studio (Arctic Valor slot), Just For The Win (Deco Diamonds), Slingshot Studios (Zombie Hoard) and Stormcraft Studios (Fortunium). Provided filters allow players to display the newest games as well as those featuring a progressive jackpot. Fans of the latter will be happy to see over 40 jackpot slots and among them the coveted Mega Moolah. Other game categories are so modestly represented we might as well list all additional options. You’ll be able to play European and 20p Roulette, a single blackjack variant, and several bingo games with prize pools worth up to £1,000. Live dealers have not entered Crazy King Casino yet, and judging by the concept, they never will. Small but diverse list of payment options includes Visa debit/credit cards, MasterCard, Maestro, PayPal, PaySafeCard and Pay By Mobile. The casino will accept deposits as low as £10 but you’ll need to fund your account with at least £20 in order to claim a bonus via the Mega Reel. The only currency available is GBP. Players can basically withdraw any amount that’s in their real money balance but will have to contact the support team if looking to cash out less than £10. It should also be noted that payouts of under £30 incur a £2.50 transaction fee. Once your account has been verified, all withdrawal requests will be subjected to a 72-hour pending period, and depending on the chosen payment method, it will take 1-3 days for the money to appear in your bank account. As far as safety and fair play is concerned, there’s really nothing to worry about; Crazy King Casino is licensed by two very strict regulatory bodies, the UK Gambling Commission and the Alderney Gambling Control Commission. You’ll find that the website is secured by GoDaddy and games tested for fairness by SQS. The operator has appointed eCOGRA for Alternative Dispute Resolution, so if you encounter an issue and can’t resolve it with the casino management, you can lodge a complaint with this reputable independent organization. All of your questions will be answered either by the operator’s customer support team or via information provided in the FAQ section. The latter addresses deposits and withdrawals, a series of account management subjects, and a good many of bonus-related elements. If the answer to your query is nowhere to be found, feel free to contact an agent via email or log in to launch Live Chat and receive a prompt reply. The website doesn’t display any social media icons and a quick search failed to discover any activities on Facebook or Twitter. It could be that the team hasn’t got around to it yet or they believe their target group would not be interested in using either. Crazy King Casino is a no-nonsense gaming site focused on providing top quality slots and plenty of opportunities to play on the house. Though it’s still very young, the Casino manages to impress with a large choice of slots provided by as many 20 developers. At the same time, there are very few options for fans of other casino games. You’ll be bombarded by various opportunities to boost your gaming budget, providing regular deposits are made via one of fully safe and convenient payment methods. The list of deposit options may not be the longest one we’ve seen but is able to meet different preferences. Waiting for the wins to be paid out may be a tad frustrating due to a very long withdrawal pending time. If you don’t find the latter to be a deal breaker and are eager to spin the reels of some of the best slots out there, make sure to give Crazy King Casino a try.